This topic describes the process of installing Redis for PCF. It covers tasks from downloading the file from the Pivotal Network through verifying the installation after configuration. Ops Manager administrators can use Role-Based Access Control (RBAC) to manage which operators can make deployment changes, view credentials, and manage user roles in Ops Manager. Therefore, your role permissions might not allow you to perform every procedure in this operator guide. For more information about roles in Ops Manager, see Understand Roles in Ops Manager. Note: Before using Redis for PCF v1.14.0 and later, you must update any BOSH add-ons to support Xenial stemcells. See Update Add-ons to Run with Xenial Stemcell. Download the Redis for PCF file from Pivotal Network. Select the latest release from the Releases dropdown. In the PCF Ops Manager Installation Dashboard, click Import a Product to upload the Redis for PCF file. Click the + sign next to the uploaded product description to add the tile to your staging area. To configure Redis for PCF, click the newly added tile. See configuration instructions in the sections below. If you are using Ops Manager v2.3 or later, click Review Pending Changes. For more information about this Ops Manager page, see Reviewing Pending Product Changes. For guidance on ports and ranges used in the Redis service, see Select Networks below. To assign AZs and networks, click the Assign AZs and Networks settings tab. As of Redis for PCF v1.9, you can assign multiple AZs to Redis jobs, however this does not guarantee high availability. For more information, see Support for Multiple AZs. In the Assign AZs and Networks tab, make your selections under Place singleton jobs in and Balance other jobs in. You can use Redis for PCF with or without using the on-demand service. To use the Redis for PCF on-demand service, you must select a network in which the service instances are created. For more information, see Networking for On-Demand Services. Note: In Ops Manager v2.0 and earlier, a specific network was designated as the Service Network to reserve IPs for the on-demand service. As of Ops Manager v2.1, IPs are no longer managed in this way. All networks are now available to use as a Service Network. In the Assign AZs and Networks tab, select a Network. Pivotal recommends that each type of PCF service run in its own network. For example, run Redis for PCF on a separate network from RabbitMQ for PCF. If using the on-demand service, select a Service Network. Otherwise, select an empty service network. 12350 TCP Outbound from Cloud Foundry to the cf-redis-broker service broker network (Only if using a cf-redis-broker) Access to the cf-redis-broker from the cloud controllers. 32768-61000 TCP Outbound from Cloud Foundry to the cf-redis-broker service broker network From the Diego Cell and Diego Brain network(s) to the service broker VM. This is only required for the shared service plan. * Typically the service broker network and service instance network(s) are the same. Click the Redis for PCF tile in the Ops Manager Installation Dashboard to display the configuration page and allocate resources to Redis service plans. 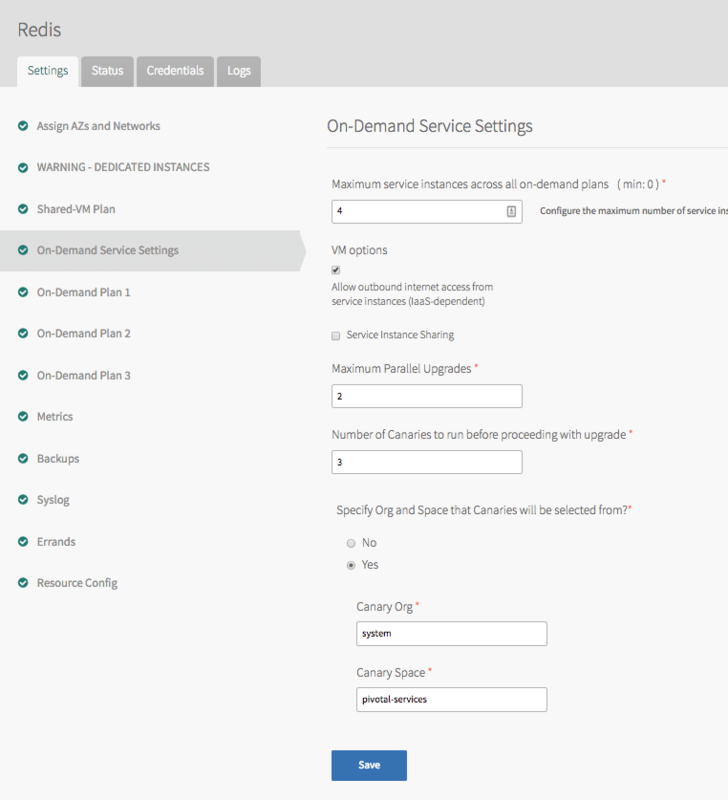 Click On-Demand Service Settings, and then enter the Maximum service instances across all on-demand plans. The maximum number of instances you set for all your on-demand plans combined cannot exceed this number. For more information, see Setting Limits for On-Demand Service Instances. Select the Allow outbound internet access from service instances checkbox. You must select this checkbox to allow external log forwarding, send backup artifacts to external destinations, and communicate with an external BOSH blob store. Note: Outbound network traffic rules also depend on your IaaS settings. Consult your network or IaaS administrator to ensure that your IaaS allows outbound traffic to the external networks you need. (Optional) Select the checkbox to enable Service Instance Sharing. Turning on sharing enables this feature for all on-demand instances. Note: To enable this feature a user with admin privileges must run cf enable-feature-flag service_instance_sharing. For information about this feature, see Sharing a Redis Instance with Another Space. (Optional) Use the Maximum Parallel Upgrades field to configure the maximum number of Redis service instances that can be upgraded at the same time. When you click Apply Changes, the on-demand broker upgrades all service instances. By default, each instance is upgraded serially. Allowing parallel upgrades reduces the time taken to apply changes. Note: Multiple Redis service instances will be concurrently unavailable during the upgrade. 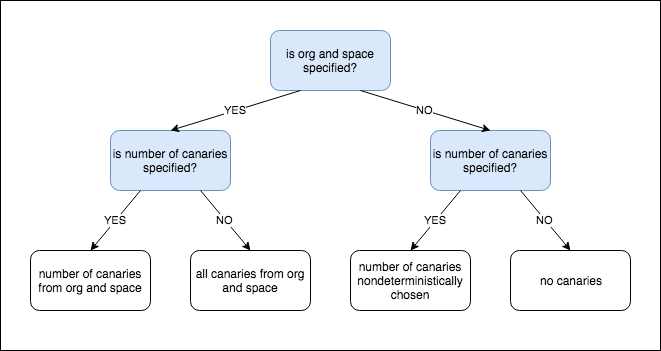 (Optional) Use the Number of Canaries to run before proceeding with upgrade field and the Specify Org and Space that Canaries will be selected from? options to specify settings for upgrade canaries. Canaries are service instances that are upgraded first. The upgrade fails if any canaries fail to upgrade. Canaries can be limited by number and by org and space. If you want to use all service instances in an org and space as canaries, set the number of canaries zero. This upgrades all service instances in the selected org and space first. Note: If you specify that canaries should be limited to an org and space that has no service instances, the upgrade fails. Note: Canary upgrades comply with the Maximum Parallel Upgrades settings. If you specify three canaries and a Maximum Parallel Upgrades of two, then two canaries upgrade, followed by the third. For information about this feature, see canaries in Upgrade All Service Instances in the On-Demand Services SDK documentation. 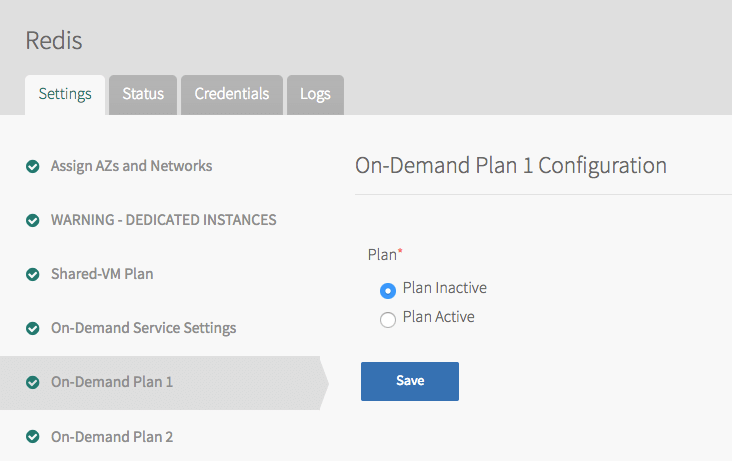 To configure an on-demand plan, click On-Demand Plan 1, 2, or 3. You can configure up to three on-demand plans with appropriate memory and disk sizes for your use case(s). Resource configuration options may vary on different IaaSes. 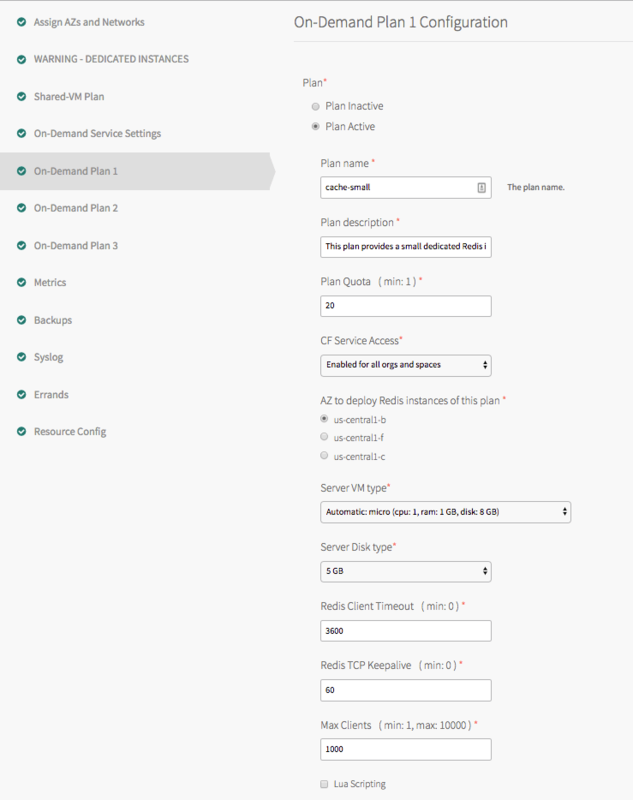 Configure the following settings for your on-demand plan(s). Any pre-populated default settings are pre-configured according to the memory and disk size of each plan. Plan Select Plan Active or Plan Inactive. An inactive plan does not need any further configuration. Plan Name Enter a name that will appear in the Marketplace. Plan Description Enter a description that will appear in the Marketplace. Specify details that will be relevant to app developers. Plan Quota Enter the maximum number of instances of this plan that app developers can create. For more information, see Setting Limits for On-Demand Service Instances. CF Service Access Select a service access level. This setting does not modify the permissions that have been previously set, and allows for manual access to be configured from the CLI. AZ to deploy Redis instances of this plan This is the AZ in which to deploy the Redis instances from the plan. This must be one of the AZs of the service network (configured in the BOSH Director tile). Server VM type Select the VM type. Pivotal recommends that the persistent disk should be at least 2.5x the VM memory for the on-demand broker and 3.5x the VM memory for cf-redis-broker. Server Disk type Select the disk type. Pivotal recommends that the persistent disk should be at least 2.5x the VM memory for the on-demand broker and 3.5x the VM memory for cf-redis-broker. Redis Client Timeout This field refers to the server timeout for an idle client specified in seconds. The default setting is 3600. Adjust this setting as needed. Redis TCP Keepalive Redis TCP Keepalive refers to the interval (in seconds) at which TCP ACKS are sent to clients. The default setting is 60. Adjust this setting as needed. Max Clients Max Clients refers to the maximum number of clients that can be connected at any one time. Per plan, the default setting is 1000 for small, 5000 for medium and 10000 for large. Adjust this setting as needed. Lua Scripting Enable or disable Lua Scripting as needed. Pivotal recommends that Lua Scripting be disabled. Note: This is a beta feature. Use it at your own risk in non-production environments. Send comments and feedback to the PCF Feedback List. Configure the Pivotal Application Service (PAS) tile to support securing service instance credentials in runtime CredHub. See Step 1: Configure the PAS Tile. After deploying the tile, notify developers that they must unbind and rebind existing service instances to secure their credentials with CredHub. Operators can update certain settings after the plans have been created. If the operator updates the VM size, disk size, or the Redis configuration settings (enabling Lua Scripting, max-clients, timeout and TCP keep-alive), these settings are implemented in all instances that are already created. Operators should not downsize the VMs or disk size because this can cause data loss in pre-existing instances. Additionally, operators cannot make a plan that was previously active, inactive, until all instances of that plan have been deleted. Go to the Resource Config page on the Redis for PCF tile, and set the Redis On-Demand Broker job instances to 0. Create an empty service network. For instructions, see this Knowledge Base article. Select the Shared-VM Plan tab. Memory and instance limits depend on the total system memory of your Redis broker VM and require some additional calculation. For more information, see Memory Limits for Shared-VM Plans below. If you do not want to use the on-demand service, you must make all of the on-demand service plans inactive. Click the tab for each on-demand plan, and select Plan Inactive. See the example in Step 4 of Removing On-Demand Service Plans above. To change the allocation of resources for the Redis broker, click the Resource Config tab. The Redis broker server runs all of the Redis instances for your Shared-VM plan. From the Resource Config page, you can change the CPU, RAM, Ephemeral Disk, and Persistent Disk made available, as needed. Additional calculation is required to configure memory limits for shared-VM plans. With these plans, several service instances share the VM, and the Redis broker also runs on this same VM. Therefore, the memory used by all the shared-vm instances combined should be at most 45% of the memory of the Redis broker VM. Decrease the Redis Instance Memory Limit. Decrease the number of instances in Redis Service Instance Limit. Increase the RAM for the Redis Broker in the Resource Config tab as shown below. Note: You can configure a larger Redis Service Instance Limit, if you are confident that the majority of the deployed instances will not use a large amount of their allocated memory, for example in development or test environments. However, this practice is not supported and can cause your server to run out of memory, preventing users from writing any more data to any Redis shared-VM instance. Do not use shared-VM instances in production environments. To configure resources for the Shared-VM plans, click the Resource Config settings tab on the Redis for PCF tile. 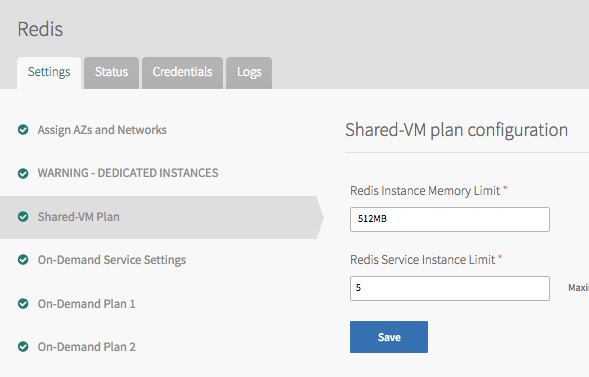 The Shared-VM plan is on the Redis Broker resource. Ensure at least one On-Demand plan is active. a. Set Redis Service Instance Limit to 0.
a. Set Broker Registrar to Off. b. Set Smoke Tests to Off. c. Set Broker Deregistrar to Off. d. Leave all four On-Demand errands On. a. Decrease Redis Broker Persistent disk type to the smallest size available. b. Decrease Redis Broker VM type to the smallest size available. c. Set Dedicated Node Instances to 0. WARNING: You must not downsize the VMs or disk size. This can cause data loss in pre-existing instances. The following table describes properties you can update in the plan configuration page, shown above. Plan Quota 20 Maximum number of Redis service instances for this plan, across all orgs and spaces. For more information, see Setting Limits for On-Demand Service Instances. For settings that app developers can configure, see Customize an On-Demand Service Instance. View logs from every VM in the Redis for PCF deployment in one place. Effectively troubleshooting when logs are lost on the source VM. Set up alerts for important error logs to monitor the deployment. All logs follow RFC5424 format. Click the Redis for PCF tile to display the configuration page, and then click the Syslog tab. Select either Yes without encryption or Yes with TLS encryption. Note: To use syslog forwarding for on-demand instances, you must select the Allow outbound internet access from service instances checkbox in the On-Demand Service Settings tab. Enter the Syslog Address and Port, and select the Transport protocol of your remote destination. You can only use TCP if you are using TLS encryption. The information required for these fields is provided by your remote destination. Address should be something such as logs.papertrailapp.com, and Port will be a number such as 41635. Permitted Peer refers to the remote syslog destination. It allows each VM to establish an encrypted tunnel with the remote syslog destination. The Permitted Peer is either the accepted fingerprint (SHA1) or name of the remote peer, for example *.example.com. 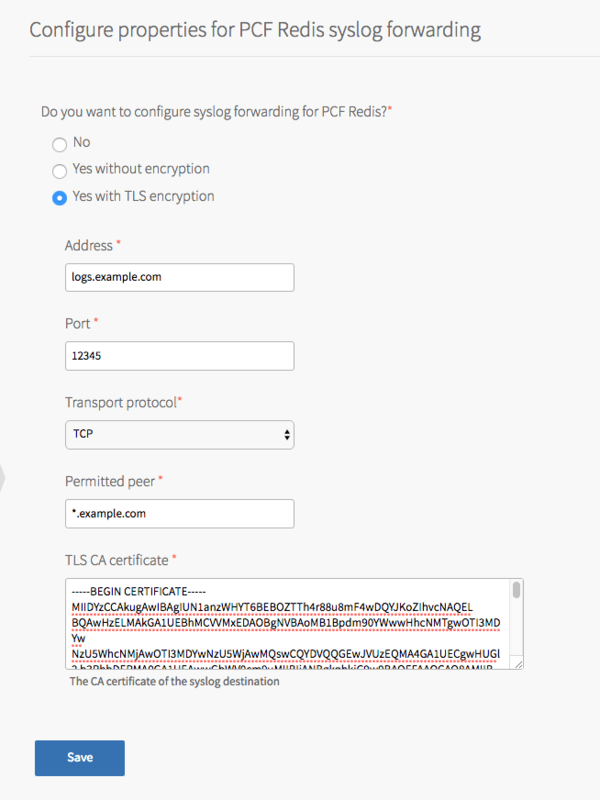 TLS CA certificate refers to the trusted certificate authorities for the remote syslog destination. Large certificate chains (> 8 kb) are not supported. Download the stemcell from Pivotal Network. In the Ops Manager, click Stemcell Library. Click Import Stemcell, and then select the stemcell you downloaded from Pivotal Network. To allow this service to have network access, you must create Application Security Groups (ASGs). Ensure your security group allows access to the Redis Service Broker VM configured in your deployment. You can obtain the IP addresses for these VMs in Ops Manager under the Resource Config section for the Redis for PCF tile. Note: Without ASGs, this service is unusable. Smoke tests run as part of Redis for PCF installation to validate that the install succeeded. For more information, see Redis for PCF Smoke Tests. In the PCF Ops Manager Installation dashboard, click the trash can icon in the lower right hand corner of the Redis for PCF tile.